The mountains are calling. Plan your perfect winter getaway with a ski, snowboard, or winter sports vacation from Southwest Vacations®. Find your winter wonderland in top ski resorts in Colorado, Utah, and northern California. Traveling with an infant? Question Mark Icon Children ages 2 or older are required to purchase an air seat for all travel. Use this link to find our current promotion codes. Skiers and snowboarders of all skill levels will appreciate what Keystone has to offer. 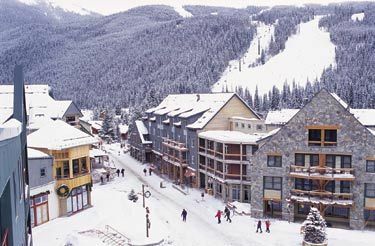 Complete with three ski mountains (Dercum Mountain, North Peak, and The Outback), five bowls, and 121 ski trails, Keystone is a winter-sports enthusiast's paradise. Note: Flight service for Keystone vacations is into Denver. Keystone offers plenty of things to do off the mountain, including ice skating, Nordic skiing, hiking, snowmobiling, gondola rides, tubing, wine tasting, and fine dining. Home to the country's largest night-skiing program. Enjoy crisp mountain air while skiing, cross country skiing, snowboarding, snowmobiling, snowshoeing, snow-tubing, ice skating, and more. Include a mix of casinos, art galleries, museums, shops, and restaurants located throughout Lake Tahoe for more fun. Note: Flight service for Lake Tahoe vacations is into Reno. Squaw Valley offers Lake Tahoe's most extensive and exciting night terrain and includes the 3.2 mile Mountain Run. Northstar-at-Tahoe Resort's beginner teaching area has been expanded and redesigned to include more of the sculpted terrain that helps improve the learning curve for beginning skiers and snowboarders. Heavenly's music scene is anything but small-town. On any given night, you can catch everyone from current recording artists and DJs to an impressive lineup of local legends-in-waiting. With a mountain boasting a summit of 10,000 feet, 106 ski trails over 3,300 acres, four terrain parks, and a superpipe, Park City is a skier's dreamland that won't disappoint. In addition, the 355 inches of snow that falls on the mountain each year makes for a pleasurable ride down Park City's uncrowded ski runs. Note: Flight service for Park City vacations is into Salt Lake City. Home of the U.S. Ski Team, Park City offers 106 trails and 3,300 acres of skiable terrain. Park City Ski Area offers a variety of terrain that suits every ability level and skier need. Four six-passenger high-speed lifts, one high-speed quad, five triples, and four doubles with a total combined lift capacity of 27,200 guests per hour. 100 total trails–18 easier, 44 more difficult, and 38 most difficult–each 1/4 to 3 1/2 miles long covering 3,300 acres of terrain with 750 acres of bowls in Jupiter, Scott's, Blue Slip, McConkey's, Homelite, and Puma bowls. Vail is the single largest mountain in North America, featuring a good mix of ski run difficulties, 34 ski lifts, and three distinct areas to ski/snowboard on the mountain. Guests can enjoy 5,289 acres of terrain to ski freely with seven bowls, and four terrain parks. A ski vacation to Vail, Colorado is a skier's dream come true. Note: Flight service for Vail vacations is into Denver. Vail's lift system includes 14 high-speed quads, a gondola, and a network of 18 other chair lifts to ensure easy access and minimal lift lines. Vail is a skier's paradise with a combined yearly average of 346 inches of snowfall and 300 days of sunshine. With 5,289 acres, Vail is the largest single ski mountain in North America, featuring seven powdery bowls, the backcountry skiing of Blue Sky Basin, and the front side. World-class dining, shopping, galleries, après ski, nightlife, and spas are all just steps from a range of accommodations to suit every budget and task. Plenty of white-powder snow in Winter Park settles on the mountains that are home to over 130 ski runs, 25 lifts, breathtaking views, and slopes for skiers of all ages and skill levels. Relax in your luxury accommodations or explore the Fraser Valley in a snowmobile. Note: Flight service for Winter Park vacations is into Denver. The Winter Park Ski and Ride School offers a variety of programs for every ability level. On top of world class skiing, Winter Park is the perfect place to try ice skating, tubing, snowmobiling, snowshoe tours, and much more. With 370 inches of snowfall per year, Winter Park is the perfect winter wonderland for enjoying a snowy vacation package.